Join the Bay Area’s premier sports camp this summer for fun, sun and sports! 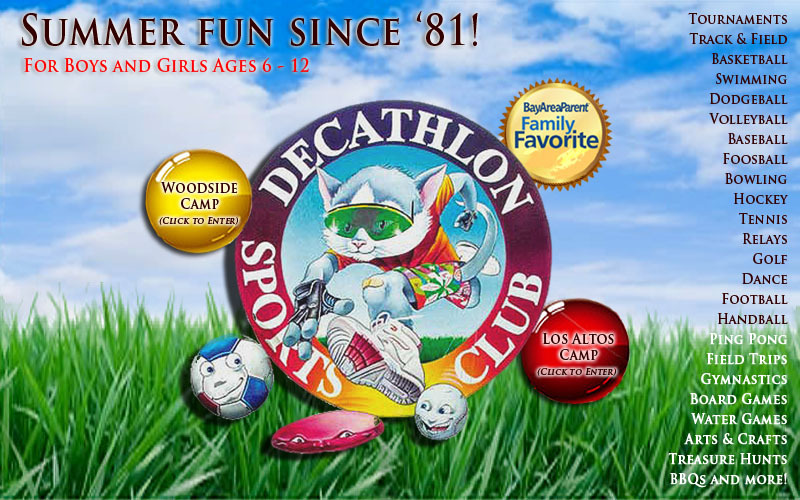 Founded in 1981, Decathlon Sports Club is an active, high-energy summer day camp providing individualized service, attention, play and instruction for boys and girls grades K-6. We work hard to create a sense of community where children feel safe and have a ton of fun. Decathlon Sports Club operates in Woodside while directors of Delta Sports Club, Inc. operate Decathlon Sports Club of Los Altos. These highly supervised locations serve families from Burlingame, Hillsborough, San Mateo, Belmont, San Carlos, Woodside, Redwood City, Atherton, Portola Valley, Menlo Park, Palo Alto, Los Altos, Sunnyvale, Mountain View, Cupertino, and Los Gatos. CLICK HERE for our Promo Video to see what THE BUZZ is all about!